AAPM offers a golden opportunity for you to reach each visitor to the AAPM Annual Meeting website — including medical physicists submitting abstracts, registering or visiting for updated meeting information. Learn about the 58th Annual Meeting in Washington, DC, in 2016. Exposure! — Deliver your message before, during and after the AAPM Annual Meeting with highly targeted, cost-effective banner advertisements (468 x 60 pixels). Meeting registrants as well as medical physicists not planning to attend the meeting visit the conference site for updated meeting information, paper submission, registration, program scheduling, and abstracts information. Your banner ad on the AAPM Meeting pages delivers qualified prospects to your exhibit booth and your website - with measurable results. Banner size is 468 x 60 pixels. Files accepted are .gif, .jpg, .html and flash files up to 40 kilobytes. Banner design services are available. Please follow the instructions below to update information for your company to be listed in the Buyers Guide. You will then be prompted to enter the unique Exhibitor USERNAME and PASSWORD provided to you from AAPM Headquarters. If you need your Exhibitor login, please contact Rachel Smiroldo or call 571-298-1230.
Review the information for your company and if necessary, edit or revise. All information listed for your company at this site will appear in the Buyers Guide. If you wish to omit certain information, please leave those appropriate record fields blank. After reviewing/updating your record, it is imperative that you CONFIRM your Exhibitor Information by selecting the CONFIRM button. Once you have confirmed, you will be taken to a second page where you can select/edit Product Focus and Product Line information for your company. You can enter the system as often as needed to add or revise information listed for your company up until May 9. After May 9, you will no longer have access to your company record. Therefore, as of May 9, the information listed in your company record will be printed in Medical Physics, the Pocket Program, and posted on the Meeting website. Be a Sponsor of an item for the 2016 AAPM Annual Meeting! AAPM offers Exhibiting companies the opportunity to sponsor items at the AAPM Meeting. In order to be a Sponsor you must be an exhibitor at the Annual Meeting. In order to reserve a sponsorship item, please complete and submit the Sponsorship form. Company name and link to your website will appear on the conference website. Logo and booth number will appear on “Sponsor Thank You” board placed in each refreshment break area in Exhibit Hall for the entire conference. Logo will appear on slide in Electronic Scroll in session room, acknowledging you as an official Sponsor and item sponsored. Logo will be posted on the online Exhibitor Floorplan. This is a great opportunity to give AAPM conference attendees something they will continue to use long after the meeting. Each registered attendee will receive an environmentally friendly manufactured tote bag with your company name and/or logo and the 2016 meeting logo. Sponsor will work with official AAPM provider. Sponsoring the smartphone AAPM Meeting App is an innovative interactive service that you can provide to conference attendees. Attendees will now have access to the Meeting program, speaker abstracts, exhibit hall floor plan, ability to create a personal appointment calendar, and much more…all via their smartphones! The AAPM Media Wall is front and center again this year. Featuring a 24 ft wide by 6.5 ft high LED video screen, the AAPM Media Wall is expected to be a focal point at the 2016 Annual Meeting. It will be located over the main entrance into the exhibit hall. The AAPM Media Wall will run from 7 am to 6:30 pm on Sunday through Wednesday for a total of 46 hours. The AAPM Media Wall will be available to a limited number of exhibitors to promote their company’s products and services with custom video content. This is a turn-key solution with the included content services and spots are available on a first come first served basis. Please contact Al Tokel with neoPromo Media Group (al@neoPromo.com | 201-245-1313) to learn more about this opportunity and to book your spot while spots are still available. A custom, 30 or 60 second video on the AAPM Media Wall on looped playback. EVERYONE uses the Internet and Evaluation Center terminals for checking email and completing the meeting evaluations...a requirement in order to obtain CEC! Over 1900 attendees completed the online evaluation for the 2015 Annual Meeting and most were completed at the meeting. Two Internet and Evaluation Center terminals stations will be placed throughout the Convention Center (2 near session meeting rooms). Logo will appear on screen of computer terminals. Logo will appear on landing page of the Internet and Meeting Evaluation Centers. Each Scientific Attendee at the Meeting will receive TWO lunch vouchers with their registration materials. This voucher is good for towards food and/or beverage purchase at any Convention Center food outlet in the Exhibit Halls. Vouchers are valid Monday and Tuesday only, between 12:15 pm - 1:45 pm. Over 1800 coupons were redeemed each day during the 2014 Annual Meeting so we know attendees take advantage of the complimentary lunch! Logo and booth number will appear on “Thank You” table tents in all concession seating areas of Exhibit Hall for the entire day. Support the new members and your future customers! A special session has been organized and members new to the association over the past 3 years have been invited to attend. New members have a chance to win a complimentary registration for next year’s AAPM Annual Meeting and will have the opportunity to engage with the AAPM Leadership. More food! Opportunity designed especially for new or smaller companies. Refreshment breaks will be held each day in the exhibit hall in the designated lounge areas during the exhibit dates. The breaks are open to all attendees, are always a big hit and well attended! Logo and booth number will appear on “Thank You” table tents in all refreshment seating areas of Exhibit Hall for the entire day refreshment break is sponsored. Logo will appear on beverage napkins during the refreshment break sponsored. If you’re interested in providing customized electronic hotel key cards, you must first complete this form for official approval from AAPM. This is a first come/first served exclusive opportunity to work independently with each hotel in the AAPM housing block on providing key cards. The approved Exhibitor will be responsible for any contracts and costs associated with the project. Sponsor will be provided with a list of the hotel contacts. Exhibitor must contact AAPM for approval of key card design. This is a great opportunity to advertise your company while attendees charge their phones and other electronics. Charging stations will be located throughout the exhibit hall. If you are interested in sponsoring the charging station you can submit either a short video clip or a static image. There will be 2 charging stations in the Welcome Lounge. This is an opportunity for one exhibitor to be the only company displaying promotional materials at these stations. Please note AAPM Meeting materials will also be displayed on these stations as well. 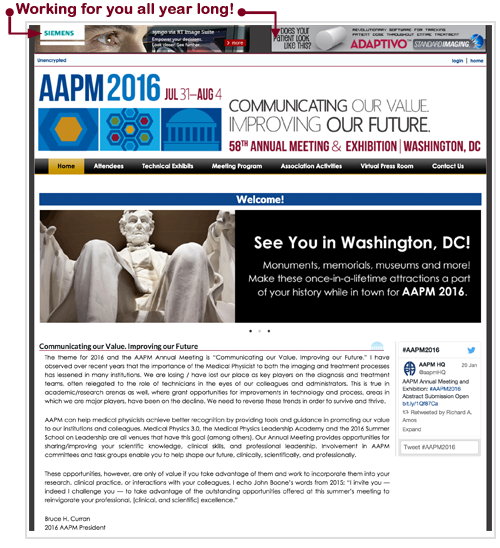 AAPM will implement a Virtual Press Room for the 2016 Meeting. The Virtual Press Room will consist of both Scientific and Exhibitor related press releases. All contributing companies will be listed on the Virtual Press Room site. A link will be created from the Press Room site/company name back to the URL address of the press release. Only companies officially exhibiting at the 2016 AAPM Meeting may submit materials for the Exhibitor Virtual Pressroom. Press releases submitted for the Exhibitor Virtual Press Room by June 25 will be printed and provided in press kits available on-site to all registered press. Details will be included in the Service Kit. We hope to attract more press personnel to our meeting so encourage you to post your releases. As an Exhibitor, you have the opportunity for a direct mail campaign; use the list of 2016 AAPM Meeting scientific registrants. We receive the bulk of our scientific registrants by June 22. *Note: Email addresses will be provided for Registrants who consented to the release of personal email addresses. For an additional fee of $50, list will be sent via email within 2 days of receipt of order. Q. How soon will I get my list? A. Under ordinary circumstances most orders are filled within 5 business days. If an order is received on Monday, we try to send it out by the following Friday. A. We do offer rush jobs. There is a $50 fee associated with such a request. A 'rush job' is one that is requested to be received by a specific date that is less than five days after the date the order is received. Please inform us by telephone or email that you will be requesting a rush job so that we can be on the lookout for your order and handle it as soon as possible. Note: We often process jobs within a day or two of receipt, but it is not guaranteed. Q. How many times can I use the list? A. The list are sold on a per-use basis. If you purchase one list, then you may use it once. Q. Why do I have to include a sample of the mailing? A. In order to ensure that our list is being used legitimately, we have a validation system in place. Whenever we come across a mailing that appears to have used our list, we check to see if we have sold a label to the sending company and that we have a sample on file. If we can't confirm that we sold labels for that mailing, then we start asking questions. Q. What's to stop me from copying the names from the list that you gave me? A. You are required to sign a statement stating that you will not do that. Q. What if I have a question that isn't on this list? A. Email us at dba@aapm.org. PLEASE NOTE: Convention Communications has implemented a Green Initiative. For each company participating in the Door Drop Service, Convention Communications will have a native tree planted in a US ecosystem restoration project to offset the resources used in printing and the carbon used for transportation. Should you be interested in using the AAPM logo in your promotional items, please contact Rachel Smiroldo. In an effort to reach as many potential attendees as possible, we encourage you to link to the AAPM 2016 Annual Meeting website http://www.aapm.org/meetings/2016AM/ from your company website.